I really appreciate the onsite updates we are getting here from the Cape. Thanks to everyone. 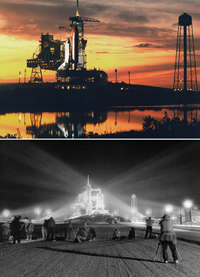 Quick question: back when I was covering launches, we (media) were taken out to the pad for RSS rollback to shoot sunset and night photos of the stack on the pad prior to the start of fueling. We would make several stops at different points around the pad perimeter before going back to the press site. Does this still happen? Sunset shoots were the best because the sun would sink so fast, light meter settings would change substantially from the time you took the reading, set the camera, and grabbed the shot. Anyway, here's my attempt to post two of the pics I shot on one of these trips. They are from the Jan. 1993 launch of STS-54. Not having any luck making them any larger without busting the attachment size limit. Maybe down the road I'll do a post on crew walkout photo ops. Those were brutal as everyone tried to get the same and best shot. Yep, they still do RSS every launch. Usually they do go to two sides, one from the side ane one on the crawlerway, though at 114 for the first attempt they only did the front shot. Second attempt they did both. I am hoping they take us to the side where the water is, just as in your shot above, for 121. The lighting conditions in those two pictures are stunning. Both of them. Hope you find a way to upload bigger size.